Houma, LA – Synergy Bank is pleased to announce that Misty Guidry is the new Mortgage Loan Originator at its Main Office in Houma. In her role as Mortgage Loan Originator, Mrs. Guidry will help customers with their mortgage needs and guide them through the application process. Guidry has over 17 years of banking and financial services experience. She joined Synergy Bank 10 years ago and has been helping families in the Bayou Region with their home buying and building needs as a mortgage loan processor. A native of Houma, Louisiana, and resident of Gibson, Louisiana, Guidry is a graduate of Terrebonne High School and Nicholls State University. “Buying a new home is a biggest financial decision that most people have to make,” said Guidry “I am excited for the opportunity to help customers realize their dreams of home ownership. Houma, LA – Synergy Bank was recently awarded the Bayou Industrial Group’s (BIG) 2019 BIG Achiever Award at their annual banquet on February 12, 2019. Synergy was recognized for numerous programs that it has implemented in the community such as the Partners in Education financial literacy program, the Pack the Bus school supply drive, and the bank’s long and strong support of the Bayou Industrial Group Scholarship Program. The BIG Achiever award recognizes companies that exemplify BIG’s mission to grow and strengthen the Bayou Region through their voluntary efforts and investments in coastal restoration/protection, infrastructure, education, economic development, and/or community development. One award is presented to an individual member and another to a company member each year. Synergy Bank is a locally owned community bank. As of December 31, 2019, the company’s total assets equaled $514 million. Synergy Bank is actively involved in over 100 local organizations in the Bayou with a focus on education, economic development, and infrastructure. Further information on the bank may be obtained from its website at www.banksynergy.com. Bayou Industrial Group is a non-profit, non-partisan organization committed to the growth and sustainability of business and industry in the Bayou Region. Members include companies, advocacy organizations, government agencies and individuals in Lafourche, Terrebonne, Assumption and St. Mary Parishes. Houma, LA – Synergy Bank and United Way of South Louisiana coordinated a multi-parish school supply drive to benefit children in need in Terrebonne and Lafourche parishes. With the help of the community, they were able to collect thousands of school supplies to be delivered to local schools. Donation bins were set up at businesses throughout Terrebonne and Lafourche parishes. Community members were encouraged to donate new school supplies. The donations were sorted and sent to the Terrebonne and Lafourche Parish School Boards to disperse among the elementary schools. “The Pack the Bus campaign that Synergy Bank (and United Way) organized will ensure not only homeless children, but all disadvantaged children in Lafourche Parish schools are provided with essential school supplies to meet the needs in maintaining their academic success,” Lafourche Parish Homeless Liaison Quentina Brown said. Marine Inspections, Mike Bruno’s Bayou Country Harley-Davidson, Nicholls Alumni Federation, Pelican Waste & Debris, Pitre Wealth Management, Raising Cane’s, Rouses Markets, South Central Industrial Association, South Central Louisiana Human Services, South Louisiana Bank, Stephanie Hebert Insurance Agency, Synergy Bank, Terrebonne General Medical Center, Terrebonne Parish Consolidated Government, Thibodaux Chamber of Commerce, Thibodaux Regional Medical Center, Trapp Cadillac, and United Way for South Louisiana. If in need of school supplies, parents can request supplies by contacting the following representatives: In Terrebonne Parish: Kwanzaa Bolden at 985-879-6400 ext. 264; In Lafourche Parish: Quentina Brown 985-532-2508. Houma, LA – Synergy Bank and United Way of South Louisiana are coordinating their fourth annual school supply drive to benefit local children and schools during the month of July. The supplies collected will be distributed to schools for the children in Terrebonne and Lafourche Parish. While all school supply donations are appreciated, some of the most needed items are colors, pencils, color pencils, scissors, loose leaf paper, spiral notebooks, binders, glue, glue sticks, rulers, construction paper, pencil bags or pouches, and school bags. We have several local businesses in the area participating in the drive. Donations can be made at the registers at participating Rouses and Cannata’s grocery stores. Supplies can be placed in the bins at one of our Pack the Bus Partner locations. The drive will take place during the month of July. All donations stay in Terrebonne and Lafourche Parish and directly benefit local students. To find more info or to post pictures of your donations, visit facebook.com/BayouPackTheBus. Effective July 1, 2018 – Due to upcoming changes to Regulation CC, Synergy Bank is modifying the indorsement standards for deposits made through remote deposit capture and mobile deposit capture services. The indorsement must read, “Mobile Deposit to Synergy Bank” followed by the signatures of the payees. Synergy Bank has the right to reject deposits made after June 30, 2018 that do not have the proper indorsement. Houma, LA – Synergy Bank’s board of directors recently named Brett Means and Kassie F. Barrancotto as Vice Presidents, Rusty Bourg as Assistant Vice President, Sarah Rhodes as Compliance Officer, and Candace Frederick as Banking Officer. The announcement was made by Jerry P. Ledet, Jr., Synergy Bank President. Mr. Means is a 2005 graduate of Vandebilt High School and received his bachelor’s degree in Business Administration from Nicholls State University in 2009. He completed the Executive MBA program at Nicholls in 2013, and he is a 2016 graduate of Louisiana State University Graduate School of Banking. Mr. Means has been with Synergy Bank since 2008, during which time he has served as a Teller and Investment Representative, and he currently serves as Commercial Lender. He is active in the community serving on the Chabert Foundation Board and as a board member for Roux for a Reason. He also is a member of the Loan Advisory Committee and Loan Administration Board for South Central Planning and Development and is on the Economic Development Committee of the Houma-Terrebonne Chamber of Commerce. Mrs. Barrancotto is a 1998 graduate of E.D. White Catholic High School and received her bachelor’s degree in Marketing from Southeastern Louisiana University in 2001. After working in the large bank environment, she joined Synergy Bank in 2013. In 2017, Mrs. Barrancotto became the Branch Manager of the newest Synergy location at South Acadia in Thibodaux. Mrs. Barrancotto also is active in the community serving on the executive board of the Thibodaux Chamber of Commerce and the board of the Bayou Country Children’s Museum. She is also a member of the Thibodaux Kiwanis Club and chairs the Aktion Club for the organization. Mr. Bourg is a 2002 graduate of South Terrebonne High School and received his bachelor’s degree in Marketing from Louisiana State University in 2006. He has eight years of banking experience and currently serves as Synergy’s Administrative Services Manager, overseeing bank security and vendor and facilities management. Mr. Bourg also fills the role of Bank Secrecy Act Officer and serves on the bank’s Information Technology Committee. He is a member of the Terrebonne Men’s Carnival Club and supporter of Coastal Conservation Association of Louisiana and Ducks Unlimited. Mrs. Rhodes is a 2004 E.D. White Catholic High School graduate and received her bachelor’s degree in Accounting from Nicholls State University in 2009. She joined Synergy Bank in 2011 where she served as a Loan Processor and Internal Auditor before being appointed to her current position of Compliance Officer. In this role, she works closely with management and employees to ensure compliance of banking laws and regulations. Mrs. Rhodes is active in the community, volunteering for charitable events and supporting several causes to help benefit the community. Mrs. Frederick is a 2000 Thibodaux High School graduate and earned her bachelor’s degree in Information Services from Nicholls State University in 2005. She received her master’s degree in Business Administration from Nicholls State University in 2010. Mrs. Frederick joined Synergy Bank in 2013 as the Information Systems Support Specialist and was later promoted to Information Technology Administrator managing the bank’s information technology systems. Mrs. Frederick leads the bank’s Information Technology Committee. Synergy Bank is a locally owned community bank with six locations serving Terrebonne and Lafourche Parishes. As of December 31, 2017, Synergy’s total assets equaled $513 million. 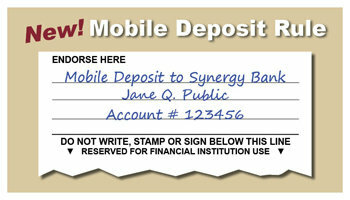 For more information about Synergy Bank, visit www.banksynergy.com. Houma, LA – Parents are encouraged to register their children for Lemonade Day, a free educational statewide initiative designed to teach children how to start, own and operate their own lemonade business. Synergy Bank is partnering with Raising Canes, Rouses, Terrebonne Parish Library, Children’s Water Safety Awareness and the Thibodaux Firemen’s to host local Lemonade Day events in both Houma and Thibodaux. The Houma Lemonade Day event will have a new location this year. It will take place Saturday, May 5 from 9 a.m. – 12 p.m. at the Houma Airbase Pavilion in conjunction with the 2nd Annual Children’s Water Safety Awareness Family Fun Day and Car Show. At the Thibodaux Lemonade Day event, the “lemonaders” will set up inside the Firemen’s Fair Grounds from 8:30 – 11 a.m., to coincide with the fair’s 5K race. At each event, the children can enter for a chance to win Best Tasting Lemonade, Most Creative Stand, and Best Salesmanship. Prizes will be awarded to the first place winners in all categories. Space is limited so please register your child in advance by contacting Elmy Savoie at marketing@banksynergy.com or 985-851-3341. The event is free to attend and participate, but participants must provide their own lemonade stand and supplies. Children who would like to host their own lemonade day stand at their homes can register directly with Lemonade Day Louisiana at https://lemonadeday.org/louisiana. Our Synergy 50+ Club enjoyed an evening of holiday cheer and delicious food at our annual Ring in the Holidays event. Guests sampled dishes from more than 30 local restaurants and viewed Christmas gift items from local retail stores. All vendors who participated were also Synergy Bank customers. The entertainment for the night kept everyone dancing. A Very Merry Almost Elton John Christmas featuring Craig Meyers featured the best of Elton John hits and beautiful Christmas music. It was a wonderful night that left our guests in the Christmas spirit. Our 50+ Club events are open to all of our customers with personal accounts who are 50 years of age and older. Be on the lookout for your invitation in the mail. "Thank you to everyone who donated. The school supplies that were collected will definitely help the students become successful in the classroom," Untied Way Executive Director Alina Merlos said. "With the right tools, these kids are better prepared, and that will help them excel in the coming year." Donation bins were set up at businesses throughout Terrebonne and Lafourche parishes. Community members were encouraged to donate new school supplies such as colors, scissors, loose leaf paper, and glue. The donations were then sorted by type of supply and sent to the Terrebonne and Lafourche Parish School Boards to disperse among the elementary schools. Many local businesses participated and assisted with the Pack the Bus School Supply Drive by serving as a drop off location, donating supplies, or donating in-kind services. Those partners were Advanced Physical Therapy, Bayou Dental Care, Bayou Country Children's Museum, Busy Bee Clinic, Cannata's, Chick Fil A, Fletcher Technical Community College, Gulf South Employer Services, Jake's Uniforms, Lafourche Parish Libraries, Lanaux & Felger CPAs APC, LOOP, Meyer Financial Group, New York Life, Nicholls Alumni Federation, Nicholls Student Union, Pelican Waste, Raising Cane's, REECO Rental, Rosemary's Soul Food Kitchen, Rouses Market, South Louisiana Bank, Stephanie Hebert Insurance, Synergy Bank, Terrebonne General Medical Center, Terrebonne Parish Government, Thibodaux Chamber of Commerce, Thibodaux Regional Medical Center, and United Way for South Louisiana. "Synergy Bank is proud to coordinate the Pack the Bus School Supply Drive with United Way for a third year," Jerry Ledet, Synergy Bank President and CEO, said. "We have been actively involved in financial education in many schools through our Partners in Education program so it was only fitting that we continue our work in supporting local schools with this campaign." The community can find more information and post pictures of their donations to our Facebook page at facebook.com/BayouPackTheBus. If you would like to sponsor or assist next year with the Pack the Bus campaign, please contact United Way of South Louisiana. Synergy Bank and United Way of South Louisiana are coordinating their third annual school supply drive to benefit local children and schools during the month of July. The supplies collected will be given to local students in Terrebonne and Lafourche Parish schools. "There are many children in our communities whose families simply cannot afford the proper school supplies needed," United Way Executive Director Alina Merlos said. "By giving a child these supplies, we as a community can help these children not only be prepared but give them the confidence to thrive." The Synergy 50+ Club was treated to another wonderful event in June at our annual shrimp boil. Our 400 guests enjoyed succulent shrimp with all the fixings, as well as a delicious slice of bananas fosters cake. Nationally-known impersonator and musician Johnny Counterfit provided the entertainment. His impersonations of favorite characters and figures from the past kept everyone laughing throughout the night. If you'd like to attend a 50+ Club event, invitations are sent to all Synergy Bank customers who are ages 50 and older. Be on the lookout for your invitation in the mail. Houma, LA – April 3, 2017- Ann V. Summers, Financial Consultant has earned the Retirement Income Certified Professional® (RICP®) professional designation from the American College of Financial Services, Bryn Mawr, PA. The RICP® educational curricula is the most complete and comprehensive program available to professional financial advisors looking to help their clients create sustainable retirement income. The rigorous three –course credential helps advisors master retirement income planning, a key focus area not fully covered in other professional designation programs. From retirement portfolio management techniques and mitigation of plan risks, to the proper use of annuities, employer-sponsored benefits and determining the best Social Security claiming age, the RICP® provides a wealth of practical information for advisors. Individuals who earn an RICP® can provide expert advice on a broad range of retirement topics including income needs and objectives, estate issues and other risks to the retirement income planning, Social Security, health insurance, housing decisions, and income taxation. Ann Summers, CRP®, RICP® is a Financial Consultant and the Program Manager for Synergy Investment Services at Synergy Bank. She assists clients with investment and wealth management strategies. Her emphasis is to help clients work towards achieving their retirement income goals. She can be reached at 985-851-5459 or ann.summers@lpl.com. Securities offered through LPL Financial, member FINRA/SIPC. Insurance products offered through LPL Financial and its licensed affiliates. Synergy Bank and Synergy Investment Services are not registered broker/dealers and not affiliated with LPL Financial. You can now enter your username and password from the Synergy Bank website. You can perform most functions from the home screen. You can filter your transactions to see pending, posted and scheduled. eStatements are now called documents under the accounts page. Your spending chart can be found by clicking the "categorize" button under the accounts page. There is now an option to hide accounts from the homepage view. Easily update password, security questions, email address and phone numbers from profile page. If you have any questions about our updated online banking system, please email our eBanking team at ebanking@banksynergy.com or call us at 985-851-2217. What browsers/versions will provide the option for TLS 1.1 or higher? The browsers listed below are certified and tested for use with Synergy's online banking. These browsers will support the option to use TLS 1.1 and higher. Are all operating systems (OS) capable of upgrading? Windows XP and Windows Vista are only capable of upgrading up to Internet Explorer 8. Users of XP and Vista may utilize Chrome and Firefox. How can I check if I'm compatible? To test for TLS 1.1 compatibility, open https://www.ssllabs.com/ssltest/viewMyClient.html within your web browser. The resulting page will look similar to the screen shots below. The protocol support box will help you determine if your browser is compatible. Can I access online banking through my mobile device? Houma, LA - The community is invited to join Synergy Bank in celebration of their sixth location with free food, live music, door prizes, and a fireworks display at their South Acadia Office Grand Opening. The fun will begin at 5:30 p.m. on Thursday, March 9th at Synergy's South Acadia Office, located at 1070 South Acadia Road in Thibodaux. "We're excited to bring this second location to serve Thibodaux," Jerry Ledet, Synergy Bank President and CEO, said. "We are looking forward to celebrating with the community and showcasing what our South Acadia Office has to offer." Live music will be provided by the local band Caro & Company, as well as the lively New Orleans favorite Kinfolk Brass Band. Bayou Community Academy Choir and E.D. White High School Jazz Band will also perform. While there, guests can register for a variety of door prizes from local restaurants and stores, as well as the Grand Giveaway - a $500 VISA® Gift Card. The event will conclude with a grand fireworks display at 7 p.m.
Houma, LA – Synergy Bank is spreading love and kindness in the community during Random Acts of Kindness Week. The plan is to start a ripple effect of good deeds by doing thoughtful acts and encouraging others to "pass it on." Synergy employees will be handing out free items to unsuspecting recipients throughout the week. These items include cash, VISA® gift cards, movie and museum tickets, and more. "At Synergy Bank, one of our values is that we show kindness to everyone we come in contact with," Jerry Ledet, Synergy Bank President and CEO, said. "The #SynergySpreadsLove campaign is just another way that we can show our love to the community and encourage others to do the same." For more details on how Synergy Bank is spreading love in the community, visit their facebook page at www.facebook.com/SynergyBank. The cut off time for deposits made through Synergy Bank ATMs, Mobile Deposit via Synergy Bank's consumer and business Mobile Apps, and Merchant Deposit Capture for businesses has been extended to 6 p.m. Deposits made through these services will be posted on the same day. As with all deposits, please note that funds may not be available for immediate withdrawal as noted in our Funds Availability Policy. If you have any questions regarding any of these services, please contact us at 985-851-2217. Synergy Bank was a proud participant and sponsor of the SOUPer Bowl, the annual fundraiser for United Way for South Louisiana. Synergy's SOUPtini was voted Fan Favorite for the second year in a row. Our SOUPtini featured delicious potato soup served in a martini glass, complete with a flaky pig in the blanket garnish. Guests could also relax and enjoy the Synergy VIP tent, complete with a bar and tables. It was a fun day for our Synergy volunteers to come together and help our community. The Synergy Bank 50+ Club traveled to New Orleans to enjoy a stunning performance of The Lion King by Broadway Across America. Our guests marveled at the beautiful costumes, puppetry, and sets of the Disney classic in great orchestra level seating. The performance was truly one-of-a-kind. Before lunch, our 50+ Club visited the prestigious Windsor Court Hotel for a delicious lunch. Located steps outside the historic French Quarter, our guests enjoyed an amazing four course meal prepared by the Windsor Court's award-winning chefs while overlooking the Mississippi River and beautiful New Orleans city skyline. A surprise visit by the Rag-a-Muffins, a trio of young barber-shop style singers, delighted our group throughout lunch. Want to join us at our next 50+ Club event? All of our customers who are ages 50 and older receive an invitation in the mail. Be on the lookout for our next event.